Cupcakes 'n Daisies: Spool- Along Sew-Along . . . Isn't this another lovely version of Spools! This quilt was made by Cindy in North Carolina. She doesn't have a blog but sent the cutest note about making this quilt and I thought I would share it with you. Her enthusiasm is contagious, if you've not started on your Spools I think Cindy will get your motor going! "I'm so excited to show you the picture of my completed Spools quilt. I am an on-again-off-again quilter who mostly makes scrappy tops/quilts for charities such as Quilts of Valor and Newborns in Need. I'm fortunate to have a job that gives me the summer off, and I decided that this summer I would make a quilt just for myself. I didn't have a particular pattern in mind, but was intrigued when I first saw Camille's Spool design. I thought it would look cute as a scrappy quilt, especially in 30's fabrics, but none of the fabric combinations I envisioned inspired me. When the PDF pattern was put on sale I went ahead and ordered it -- the first time I've purchased a pattern this way (so fast and easy -- and it saves the cost of shipping) and the first Thimble Blossoms pattern I've bought. That was on July 11. 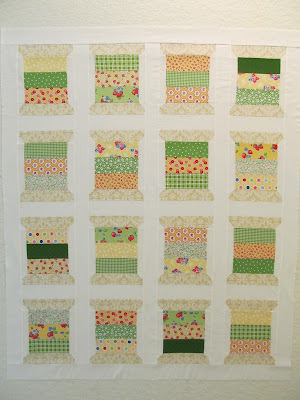 I was doing some on-line "window shopping" when I saw the Pam Kitty Morning yellow and green 15 FQ set at Shabby Fabrics. I loved this line when it first came out, but it wasn't until I envisioned it made into a Spools quilt that I fell head-over-heels-gotta-have-it-now in love. I knew it would be perfect for my yellow sewing room, which I call "The Tree Fort" because it is in my walk-up attic and is the play space I always wanted, but never had, as a child. Shabby Fabrics also had a Robert Kaufman fabric called Regency Square that seemed destined to be the spool tops. I ordered the fabric even though -- brace yourself -- it wasn't on sale. I believe this is the first time in my life I've purchased fabric that wasn't discounted in one way or another. Since it happened to be my birthday (July 16), I completely lost control and also ordered the adorable Betsy's Closet in Stitches kit. That would make a fun stitch/quilt along. The fabric arrived on the 20th, and (another first) I immediately washed, dried, and cut it. I usually pet and fondle fabric for quite a while before I cut it, but this time I dove right in. I did cut out the Kona Snow I had on hand for the sashing first, but otherwise that pretty stack of PKM didn't have time to get used to its new home before it was sliced and diced. I made one complete block that night, and by July 24 the entire quilt was done. The pattern was very well written and easy to understand. My wonderful long arm quilter, Margaret, used to live just a few miles from me. She has moved to the beach, but once a month she returns to town and sets up shop at the local LQS where customers can drop off or pick up quilts. She will be here on August 1, and I have an appointment to leave the Spools quilt with her. I don't have a bog, but I appreciate the opportunity you've provided to participate in this "Spool-Along." Cindy, thank you for participating, I'm so happy you could join us! Since Cindy doesn't have a blog I sure hope you'll leave some comments on this post for her, thanks so much! Great job on your quilt. I just love it. I'm also intrigued about your tree fort sewing room. I wish you would provide a picture. Hey Cindy...your quilt is awesome! And I'm intrigued by your "tree fort" quilting room!!! ENJOY! What a beautiful quilt, Cindy. I am sure it will look great in your tree fort! Bravo Cindy! It's beautiful! I think with all the charitable quilts you've made, it was surely time for something special just for you....full priced fabric included. Good for you. I LOVE your quilt. Cindy, I love your thimble quilt! I have the PKM fabrics and I may make mine similar. You deserved to make yourself a quilt after sewing charity quilts! So cute and thanks for sharing it with us through Thelma! Cindy, great story...all your "firsts" made me smile. Love the thought of having a tree house sewing room...sounds wonderful. Your spools are beautiful! Cindy in North Carolina -- I love your spools! You should really start a blog because you REALLY have a way with words and story-telling. Really! I would love to see pictures of your walk-up attic sewing room/play area! Love the spools...I think Cindy needs a blog too! Thelma - what's your Yo-Yo count up to now? I had a guess on the low side and I think I might be winning!! Cindy, your quilt is beautiful and so is your descripton of its creation. I know it will look perfect in your Tree Fort! Thelma, so glad you shared Cindy's story with us! Cindy's quilt is wonderful! I purchased the pdf pattern the other night and this will definitely inspire me! Thanks, Thelma, for sharing these spool quilts with us!